Have You Thought About Getting Custom Wood Garage Doors? It’s always exciting to think about remodeling or fixing up your home. You get to think about all of the upgrades you can make. It’s fun to imagine what your house will look like when all the work is done. But, it can also be a little overwhelming. What kind of new look do you want to give your home? Where and how do you start the process? It’s not always easy to figure out the answers to these questions. But, with a little guidance, you can make a decision that will leave you extremely satisfied with your home! One of the things you might consider as you remodel your home is the garage door. Believe it or not, by simply changing the appearance of your garage door, you can create a whole new look for your home But, there are so many options! Custom wood garage doors? Glass? Vinyl? Perhaps you’ve been thinking about customizing your garage doors. But maybe you’re just not sure how to go about it. Let’s say you’re really entertaining the thought of installing custom wood garage doors because you really like the appearance of “wood look” garage doors. But, before you install new doors, you want to learn a little more about them. You want to know what you’re getting before you make such a big change and investment. If this is the case, then you’ve definitely come to the right place! We’ve got information for all of your garage door needs. And, if you want to gain a little more knowledge concerning wood grain garage doors, we’ve got some helpful information for you! Let’s talk a little bit about these garage doors and, hopefully, you will be able to figure out whether or not this is the route that you want to go! As you probably already know, wood looks amazing. It’s hard not to like this classy material. It’s visually appealing and comes in many different shades and types. But, the unfortunate thing about wood is that it attracts wood-eating pests. Also, excess moisture can cause a lot of damage to wooden garage doors. Water can cause warping and swelling since moisture weakens the wood. 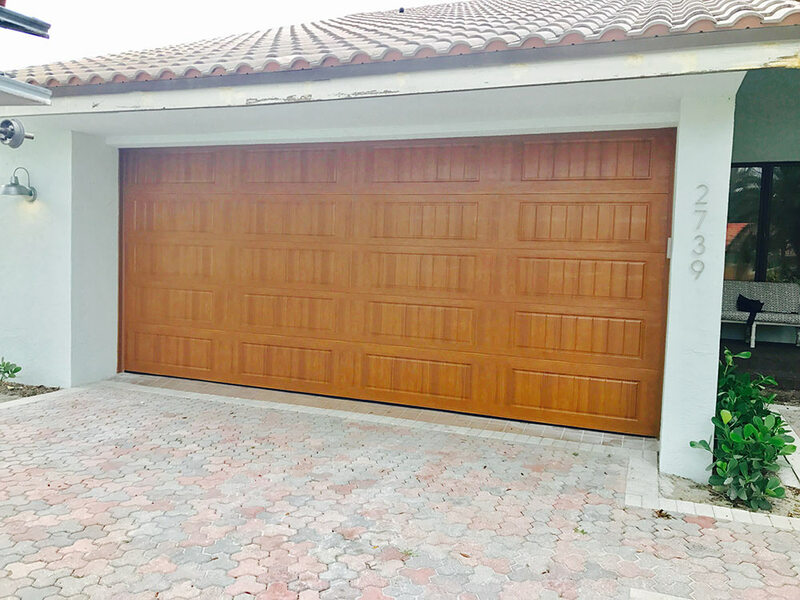 So, areas that are prone to get rainy days frequently, like here in South Florida, are definitely not the best places for actual wood garage doors. There are some types of wood that are more durable and can do a better job of staying in tact. But, that leads to another disadvantage of real wood garage doors. The more durable options are generally very expensive. Not only does it cost quite a bit to install these doors, but maintaining wood grain garage doors is also pretty costly. There are some other disadvantages regarding wooden doors for the garage. Wood doors are very heavy and require a lot of special care as far as parts are concerned. Basically, since they’re so heavy, people often find themselves having to use custom openers, springs, and other garage door parts that are designed for such heavy lifting. These doors are also far too heavy for manual opening. Also, many people find that their wooden garage doors have problems with insulation. Of course, it depends on the type and thickness of the wood. But, many wooden doors have an issue in this area. We mentioned that maintaining wooden doors can be expensive. Another issue regarding maintenance is the frequent need for it. 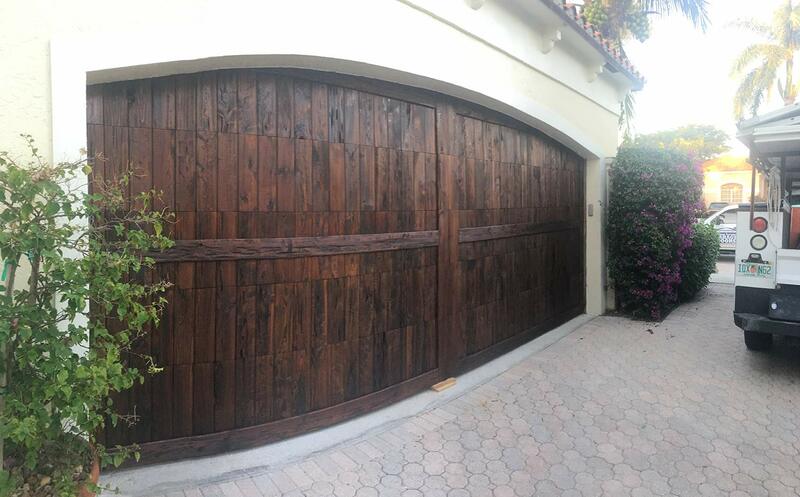 Wood grain garage doors need care pretty often. In addition to the normal maintenance which you might expect from with type of garage door, yearly sanding, painting, or staining are also necessary. Still Want the “Wood Look” for Your Garage? Alright. So, by now you’re probably feeling a little discouraged. After all, your heart has been set on achieving the classic and beautiful appearance that a wooden garage door would add to your home. It’s been on your mind for a while but, now, you’ve heard all about the disadvantages of wood doors for your garage. It seems like a waste of time and money to get them installed. But, you really wanted “wood look” garage doors. So, now what? Where do you go from here? Well, don’t give up so quickly! The good news is that custom wood garage doors can be made from much more durable material and overlayed to give the appearance of real wood! In other words, you can get the look of wood without using the actual material. Yes, that means you can still have a wood door but you don’t have to worry about the disadvantages we mentioned! This is extremely beneficial because it allows you to have the option of durability while still getting the classic look you want for your home. Also, the fact that they are customizable is, of course, a really big plus! A faux woodgrain finish can be applied to sturdy, durable steel doors. 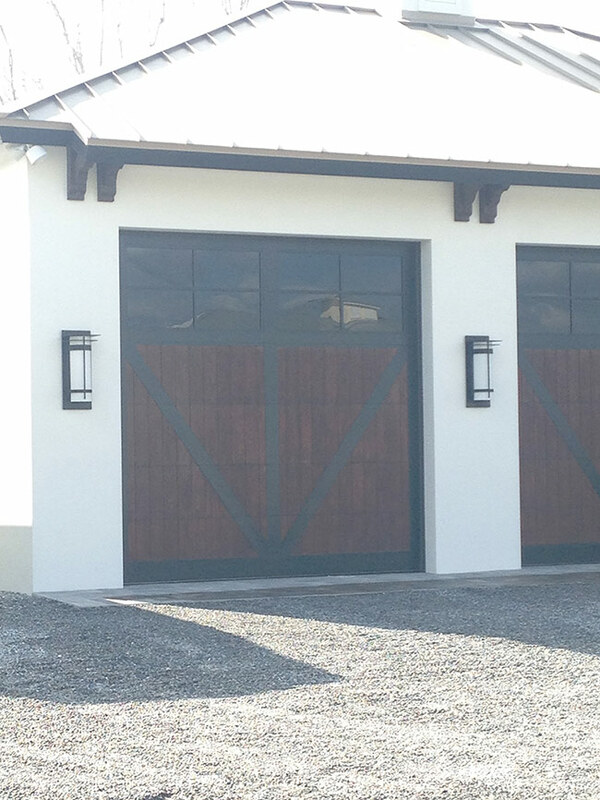 So, you might say that custom wood garage doors give you the look of wood with the sturdiness of steel, literally! Some faux wood garage doors are made of fiberglass instead of steel. You can choose from a number of wood types and colors, including mahogany, cedar, and oak. There are plenty more benefits to installing these faux wood doors instead of real wood garage doors. Let’s take a look at some of the great advantages! Then, we’ll tell you how we can help you to achieve the look you want as you prepare for the installation of a new garage door at your home! Since these custom wood garage doors are made of either steel or fiberglass, they are not going to receive damage from excess moisture, as real wood does. That means no warping or swelling as a result of exposure to moisture. This makes them more ideal for South Florida homes. Also, because these doors are able to stand up to water, they are also resistant to things like mold and mildew. So, they offer you a long-lasting and durable garage door option! Insulation is also much less of a problem when you’re using faux wood doors instead of real wood. In fact, these doors are generally highly insulated and can remain fairly warm during the cooler days. Remember the expense factor we mentioned in regards to real wood doors? Installation is usually very pricey. But faux wooden doors are much more affordable! So, basically, they cost less but offer you more benefits. Sounds like a win-win situation to us! Maintenance is less of an issue with faux wood. These doors need a lot less attention than real wooden doors. Annual staining, sanding, and painting is no longer a need when faux wood is involved! This can help you to keep money in your pocket and rid you of the headache that comes with having to keep up with regular and expensive maintenance concerns. 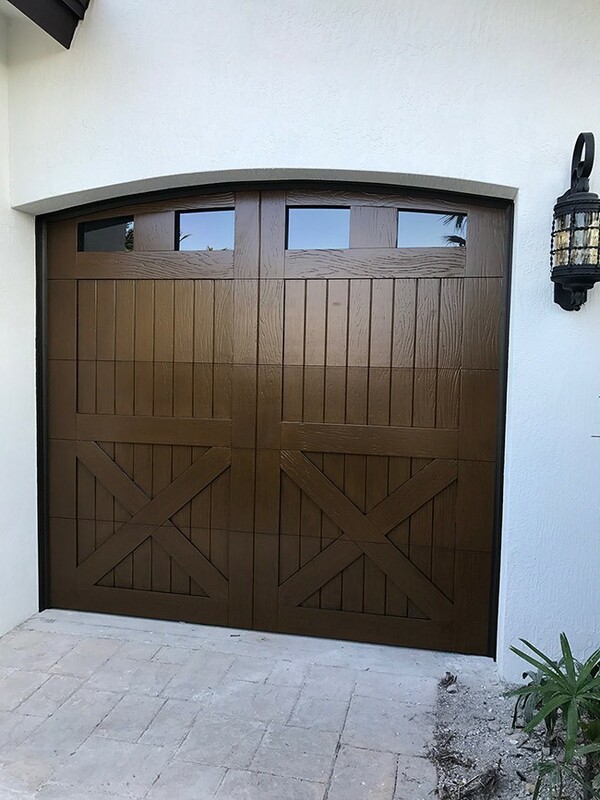 These doors, sometimes called “wood look garage doors”, are very beneficial because they are easy to keep clean and take care of. They aren’t as heavy as real wooden doors, so, this can be helpful in the event that you need to open the door manually. It also helps you to save on the cost of special and expensive garage door parts. Now that you’ve learned a little more about the benefits of custom wood garage doors, you’re probably ready to move ahead with your plan to install one! No doubt, you are relieved to know that you can still have the rich and classic appearance of wood in addition to the sturdiness and durability of fiberglass or steel. It’s nice to know that you can, in a sense, have your cake and eat it too! Many people are unaware of the fact that you can save money and time by installing faux wooden doors instead of real wood doors. But, now that you know about this great option, you can move ahead with your home renovations knowing that you will be able to achieve the appearance that you want! Here at AYS Garage Doors, we can help you begin your home makeover by installing your new garage door! We provide homes and businesses here in South Florida with the very best services. Contact us today to let us meet your garage door needs! Just call us at (561) 846-2378 and let us install your custom door today! **Originally posted on January 30, 2019. Updated March 12, 2019.